Walker County is a county located in the east central section of the U.S. state of Texas. As of the 2010 census, its population was 67,861. Its county seat is Huntsville. Initially, Walker County was named for Robert J. Walker, a legislator from Mississippi who introduced into the United States Congress the resolution to annex Texas. Walker later supported the Union during the Civil War and earned some enmity. In order to keep the county's name, the state renamed it for Samuel H. Walker, a Texas Ranger and soldier in the United States Army. Walker County is part of the Huntsville, TX Micropolitan Statistical Area as well as the Houston–The Woodlands, TX Combined Statistical Area. Americans James Mitchell (1795–1870) and his wife, the former Calpernia Franklin (1805–1865), immigrated to the future Walker County in 1833 and were awarded a Mexican land grant. Mitchell, who became one of the first county commissioners, established the Mitchell House and Inn on the Old San Antonio Road, also known as El Camino Real. During the 1840s, the house was a stop for weary and hungry stagecoach travelers. According to the U.S. Census Bureau, the county has a total area of 802 square miles (2,080 km2), of which 784 square miles (2,030 km2) is land and 17 square miles (44 km2) (2.2%) is water. As of the census of 2000, there were 61,758 people, 18,303 households, and 11,384 families residing in the county. The population density was 78 people per square mile (30/km²). There were 21,099 housing units at an average density of 27 per square mile (10/km²). The racial makeup of the county was 69.12% White, 23.88% Black or African American, 0.35% Native American, 0.77% Asian, 0.05% Pacific Islander, 4.42% from other races, and 1.41% from two or more races. 14.11% of the population were Hispanic or Latino of any race. There were 18,303 households out of which 28.70% had children under the age of 18 living with them, 46.80% were married couples living together, 11.70% had a female householder with no husband present, and 37.80% were non-families. 27.00% of all households were made up of individuals and 8.00% had someone living alone who was 65 years of age or older. The average household size was 2.44 and the average family size was 3.02. In the county, the population was spread out with 18.00% under the age of 18, 23.00% from 18 to 24, 31.10% from 25 to 44, 18.90% from 45 to 64, and 8.90% who were 65 years of age or older. The median age was 31 years. For every 100 females, there were 151.10 males. For every 100 females age 18 and over, there were 161.90 males. The median income for a household in the county was $31,468, and the median income for a family was $42,589. Males had a median income of $27,634 versus $22,579 for females. The per capita income for the county was $14,508. About 10.60% of families and 18.40% of the population were below the poverty line, including 19.10% of those under age 18 and 13.40% of those age 65 or over. 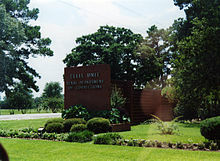 Sam Houston State University is located in Huntsville. The Gulf Coast Trades Center, a charter school, is in an unincorporated area of the county. The headquarters of the Texas Department of Criminal Justice (TDCJ), the Texas agency that operates adult state correctional facilities, are in Huntsville. Walker County has the highest number of state prisons and jails of all of the counties in Texas. Several TDCJ prisons for men, including the Byrd Unit, the Goree Unit, the Huntsville Unit, and the Wynne Unit, are in the Huntsville city limits. The Holliday Unit, a transfer unit, is in Huntsville. In addition the Ellis Unit and the Estelle Unit are in unincorporated areas of Walker County. The Huntsville Unit houses the State of Texas execution chamber. Wikimedia Commons has media related to Walker County, Texas. ^ a b "Education Service Center, Region VI Archived November 17, 2011, at the Wayback Machine." (Map) Educational Service Center 6. Retrieved December 8, 2011. ^ "We can be reached at: Archived December 3, 2011, at the Wayback Machine" Gulf Coast Trades Center. Retrieved December 8, 2011. "Gulf Coast Trades Center / Raven School 143 Forest Service Rd. 233 New Waverly, TX 77358"
^ "Huntsville Prison Blues." National Public Radio. September 10, 2001. Retrieved December 2, 2009. ^ "LIVINGSTON NAMED EXECUTIVE DIRECTOR OF STATE’S CRIMINAL JUSTICE AGENCY Archived January 25, 2010, at the Wayback Machine." Texas Department of Criminal Justice. July 28, 2005. Retrieved December 2, 2009. ^ Horswell, Cindy. "For hard-hit economy of Liberty County, crime officially pays." Houston Chronicle. 29 June 1995, A30, Retrieved July 23, 2010. ^ "Byrd Unit Archived July 25, 2010, at the Wayback Machine." Texas Department of Criminal Justice. Retrieved May 10, 2010. ^ "Goree Unit Archived July 25, 2010, at the Wayback Machine." Texas Department of Criminal Justice. Retrieved May 10, 2010. ^ "Huntsville Unit Archived March 30, 2008, at the Wayback Machine." Texas Department of Criminal Justice. Retrieved May 10, 2010. ^ "Wynne Unit Archived July 25, 2010, at the Wayback Machine." Texas Department of Criminal Justice. Retrieved May 10, 2010. ^ "Holliday Unit Archived July 25, 2010, at the Wayback Machine." Texas Department of Criminal Justice. Retrieved July 13, 2010. ^ "Ellis Unit Archived July 25, 2010, at the Wayback Machine." Texas Department of Criminal Justice. Retrieved May 10, 2010. ^ "Estelle Unit Archived January 25, 2010, at the Wayback Machine." Texas Department of Criminal Justice. Retrieved May 10, 2010. ^ "Death Tow Facts Archived November 5, 2010, at the Wayback Machine." Texas Department of Criminal Justice. Retrieved May 7, 2010. ^ Leip, David. "Dave Leip's Atlas of U.S. Presidential Elections". uselectionatlas.org. Retrieved August 1, 2018. ^ "Marilyn McAdams Sibley". Huntsville Item online. Retrieved September 23, 2010. This page was last edited on 22 December 2018, at 04:51 (UTC).